PV cells come in a variety of shapes and colours, from grey “solar tiles” that look like roof tiles to panels and transparent cells that you can use on conservatories and glass. The strength of a PV cell is measured in kilowatt peak (kWp). That’s the amount of energy the cell generates in full sunlight. Together we will notify your electricity supplier that you’re installing a PV system and they will send you some forms which we will help you fill out and send off. Once your electricity provider has processed your application, you will start to receive FiT payments. These will be paid quarterly in arrears and will appear on your electricity bill. The bill will also include credit for any electricity you have exported. How do I use the electricity? Solar panels produce DC or ‘direct current’ electricity. To be able to use this in our property it must be converted to Alternating Current (AC) and synchronised with your grid electricity supply using an inverter. The inverter constantly monitors the electricity imported from the national grid and then modifies the DC produced by the solar panels to match the usable electricity perfectly. From the inverter we run a cable to your consumer unit (Fuse box). This enables you to use the electricity you generate and automatically sell back to the grid what you don’t! Watt Energy Saver can give advice on how to best make use of the electricity you generate, feel free to ask one of our engineers! During our site survey we can agree location of equipment routes which cables can (and cannot !) take. We treat ever property we enter as our own to ensure the least amount of disruption is caused. How do I know if a Solar PV system is suitable for my property? 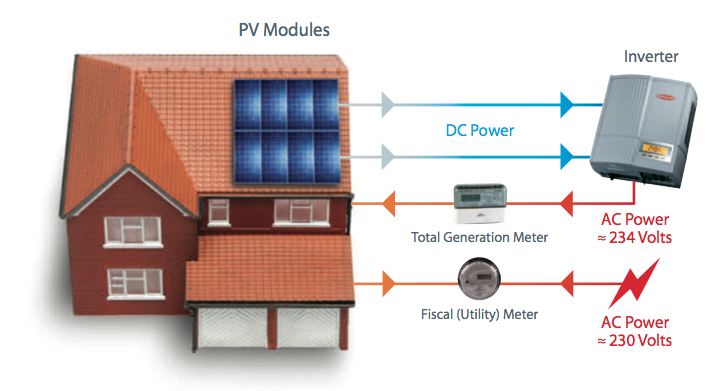 What is the Feed In Tariff (F.I.T) and How Much Will I Make? You earn a fixed income for every kilowatt hour of electricity you generate. Based on the size of system you have require, you will be paid a fixed rate per kWh generated. These tax free rates are guaranteed for twenty years from date of installation and are index linked against RPI (therefore will rise with inflation). You earn an additional tariff for every kilowatt hour of electricity you generate and sell back to the grid. Most electricity suppliers are not metering the export of electricity. They are paying the export rate on half the total generated. For this reason we have calculated the returns based on you using half the energy generated with the other half exported. This saving comes from using the energy generated by your solar PV in your own property which you would have otherwise had to purchase from your supplier. How Long Does It TakeTo Repay The Embedded Carbon? The time period for a photovoltaic cell to generate enough electricity to pay back the carbon (energy) required to make it is generally shorter than the economic payback, and is nearly always under four years. Do I Need To Inform The National Grid?